Mt. Healthy - The HOUSEOFDOOM!!! ...Hasn't Met THIS Little Girl! Speaking Of Scary, Get A Load Of Him! And He Sounds Way Creepier Than He Looks. Brrrrrrrrrr!!!! If Satan's In The House, We Run His Photo! Longtime Mt. Healthy Haunted Hall staffer Betty Hancock wasn’t performing inside the haunt as usual-instead she was working the ticket booth as a result of a broken foot. We’re assured there’s no truth to the rumor that this was a result of kicking the behind of a local haunt reviewer. As we talked to her about this year’s Hall, we surveyed the graveyard behind the ticket booth. There was a shambling zombie with its neck tilted to the side as if it had been broken. With its hair in disarray and splattered with blood, it drug a large stuffed toy behind it as it lurched slowly ahead. As it turned its head towards us, it exposed its mouth-an area of nothing but teeth surrounded by a raw area where the skin had been ripped away to expose the glistening muscle and sinew beneath. What made this particular zombie really impressive is that it was one of the Hall’s pint sized volunteers-a little girl that one suspects has watched a LOT of the Walking Dead on TV. She’s only one of the ghouls who call the Hall their home-a collection of some of the most memorable characters in the area. Between the characters and some of the new scenes making their debut this year, it’s a gas-and in more ways than one, as we’ll see. Assuming no one ‘meats’ with a terrible ‘end’ at Fangface’s hands (here’s a hint-just like Bug Boy’s barbershop from last season, DO NOT tell Fangface you want it “long in the back”), you’re hustled past some holding cells with other prisoners equally eager to make your acquaintance and into the Hall’s Hellevator. No choices given this season-it’s straight on to Floor 13 and your appointment with the gas chamber. Clouds of toxic gas fill the room-this is the first gas attack on today’s tour, and by no means the deadliest. Still, it looks like its curtains-at least until a hooded silhouette enters the room and shows you the way out. Relief washes over the would-be victims until the figure draws back his hood to reveal the grinning, gap toothed visage of the Right Honorable Reverend Emmett Rotts. Played by Eric Sterwerf (the brains behind many of the Hall’s craziest scenes the past few seasons), apparently Rotts has decided to do some moonlighting as the prison’s executioner. What could be better for a killer klergyman than getting to wipe out the sinners AND have it all be sanctioned by the state? It all leads to here-the electric chair room, with not one but two dead man’s thrones. Unlike other haunts where hauntgoers idly view an animatronic thrashing around as its fried in the chair, here it’s a do-it-yourself project. Yes, this time it’ll be YOU getting fried! Electrocuting the audience members is a great idea that the Hall came upon providentially rather than planning out. As two of the Hall’s longtime volunteers, Andy Schehr (a veteran of all 24 years) and Mark Roetting (not far behind at 18), tell us, time was running short on putting the haunt together. The Hall only has a couple of weeks to construct the entire event from the ground up, and there wasn’t going to be time to finish the animatronic that was planned for the chairs. Instead, a vibrating mechanism was attached to them and members of each group get to experience the ‘jolt’ of being electrocuted. Other than actually killing off hauntgoers (we’ve been told that’s being planned next year for the big 25th anniversary), it’s the ultimate in crowd interaction! A grinning Rotts leers and croaks “The ladies just love it!”, a claim that’s echoed by the staff. As one might imagine, the Hall’s prison ends with the ‘last mile’ to the electric chair. The rest of the scenes inside the actual Hall feature popular recurring characters. There’s Dr. Crazy, still trying to reanimate the dead after his epic fail from last year. He’s SURE he knows what went wrong and that he’s got it all figured out. Us, we’re not so sure. But you’ll never know until his newest experiment under that bloodstained sheet is revealed! Another Hall favorite is the Grim Reaper, stalking the blackness of the cemetery in the final room. In between these two scenes, back in his accustomed ‘digs’, is classic haunt character Count Dracula. Dracula was a staple of the very first Cincinnati haunt in 1970 and while you don’t see him at other attractions much these days, he continues to show he still has what it takes every season at the Haunted Hall. And speaking of recurring characters, the saga of The HOD!! !’s favorite haunt scaractor continues. We’re speaking of course about Bug Boy, the Hall’s ‘notorious derelict corpse’. Easily identified by his insect covered white shirt and grinning skull face, he was first glimpsed 20 years ago or more. Sitting in his sleaz-y chair watching a static filled TV in a room where the walls were filled with crawling insects (the same walls currently found in Dr. Crazy’s lab), the Bugster has thrived. The years go by, the costume and mask changes along with the actors who portray him, but the legend lives on! The one thing that never changes is the trouble he finds himself in from season to season! He’s taken a job at a barber shop, tried his hand at rapping, been bartender at a local hangout, been on the lam from the cops, and even tried fleecing old people out of their social security checks by cheating at bingo. And this year, he’s facing the ultimate sticky situation-marriage! Yes, this season the Hall’s storage shed (usually the setting for the year’s most whimsical scenes) has been converted to a chapel and is home to the unholy union of star crossed lovers Bug Boy and Bug Girl. Bug Girl is the large, mutated version of one of the insects found on her prospective husband’s shirt. We’re not sure if you can refer to an insect’s antennae as ‘horns’, but if you can, you could say that Bug Girl has quite the rack! But this evening, things aren’t working out for the poor girl-Bug Boy has seemingly gotten cold feet (not unusual for a corpse) and has left her at the altar. One of the Hall’s staffers was busily questioning hauntgoers if they had seen the elusive groom lurking nearby, but to no avail. We couldn’t understand why-maybe it had something to do with insects devouring their spouses after mating. It does seem as if the story had a happy ending as we did glimpse the Bugster, resplendent in his top hat, fawning on his new bride after we had found our way out of the maze. Could Bug Baby be far behind? The Hall’s old shed has been home to the Monster Maternity in the past-maybe it’ll need to be brought back for the 25th anniversary! After the “Wee Chapel of the Bugster”, there’s a series of tents and outdoor tableaus with scenes both new and old. Returning from last season is Crystal Lake, featuring the Hall’s awesome home-made lake with rolling fog and atmospheric lighting. There’s an old-time special effect utilizing mirrors that makes it look as if slasher Jason Voorhees’s latest victim has been chopped in half and stuck on a pole, where she screams for help. And of course, where you find victims, you’ll find Jason. The fast-moving Vortex tunnel spins hauntgoers on their way into the ‘sliding scarecrow’ field. A mirrored funhouse (three times bigger than last year) is home to several Klowns and a haunted toy box-it also has the Hall’s unique spinning floor. According to Mark, when installed years ago, it was four times as fast as it is now-and it’s still fast enough to make even the most sure-footed hauntgoers into a stumbling buffoon. The fog-choked werewolf woods are as spooky as ever, with an excellent performance from a hyperactive wild werewolf who could really belt out a HOOOOOOWWWWWWWWLLLLLLLL!!!!! (she’s also the mother of the little zombie out front-it’s almost a modern-day Munsters!). A witch brews up trouble right next door. Pumpkins big and small infest a room, along with the Pump-King. The most chilling scene, though, was the blackened mine shaft. From the darkness, some sort of unseen creature crawled about on the ground, getting closer and closer. The sounds it made were the ultimate in creepy-a cross between a hissing rattlesnake, a gurgling slashed throat, and a swarm of insects. The actor’s vocal talents impressed even this veteran haunter-he’s the early favorite for haunt actor of the year even though he never came out into the light. We snapped a photo to see what he looked like later, and the visage was every bit as impressive as the voice-check out the photo for yourself (it’s in the group before this article). Located at the outskirts of the Crystal Lake area, right before the entrance to the Hall’s mineshaft stands one of the Hall’s new scenes. It wasn’t a complete surprise to us, since Haunted Hall Matt had sort of ‘leaked’ it back on The HOD!! !’s Haunt Message Board back in April (“The dog poop monster is closer to reality than you think”). But there it stands, more than five feet above the ground-the Hall’s brand new outhouse and the scene of its second gas attack. You know things are likely to get messy when a mine worker wearing a gas mask bursts out of the outhouse and jumps down into the path of your group. Pointing to the tunnel under the outhouse, he says “I wouldn’t go in there if I were you!” Clambering up a ladder back to the outhouse, he enters the structure and slams the door. It isn’t long before a waterfall of yellowish liquid is cascading from the bottom of the outhouse onto the ground along with sh...uhhhh, other stuff. Sighing with relief from inside, the worker informs you it’s now OK to pass (he sure did). The only thing we can think of that’s less appealing than walking through the mess left on the ground is to have been standing there a few seconds before! It’s a classic haunt gross-out moment. The disgusting bathroom isn’t new-Club Blood at Kings Island gives you the world’s filthiest public restroom, and St. Rita’s, Dent, USS Nightmare, and Dungeons of Delhi all have variants of it. But the Hall is the ONLY place in town where it’s a totally immersive experience-although hopefully it won’t be your shoes or the top of your head that are immersed. As a bonus, the scene also provides an opening startle scare when the miner comes hurtling down from above-our friends at Ohio Valley Haunts were taken completely by surprise as they approached. Only the Hall would have the imagination to think of an elevated outhouse with the tour passing underneath, and then have enough nerve to actually go ahead and build it! Eric and Matt began work on the outhouse/cave/mine complex months before construction started on the rest of the Hall. 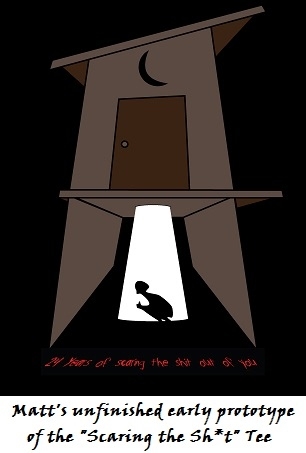 Eric's only regret in the matter is that they didn't use his suggestion for this season's Haunted Hall T-Shirt: "24 years of scaring the sh-t out of you!" There have been some rumors that plans were afoot to take the Haunted Hall to its 25th anniversary next season and then shut it down. Not only would that be a great loss to the local haunt community, but on a personal level, we don’t think there’s any haunt that’d we’d miss more. The staffers admit that the rigors of putting up the attraction in such a short time have been compounded by dwindling assistance from volunteer groups and that shutting down had been brought up. However, as Betty told us, “When October rolls around, you get started putting things together, the adrenaline and excitement kick in, and nobody’s thinking about calling it quits”. Andy and Mark also concur that the Hall will survive its 25th season and return to provide its unique blend of horror, gross-out, startles, whimsy, humor and fun to Tri-State haunters. The Hall already has ‘screened’ plans for its ‘silver’ anniversary, and keeping it ‘reel’ is a major part of that. From the descriptions of the planned line-up of rooms, classic props being resurrected, and refitting done to some existing scenes, it sounds like it could be what we here at The HOD!!! would consider our dream haunt. It’ll be fresh, unique, and throwback all at the same time. It couldn’t be in better hands and we’re already excitedly looking forward to it. But that's looking a bit too far ahead-looking back, the Hall has long been one of the best haunt values in town, and you can still get in for less than ten bucks with the donation of a canned good. Just don’t bring any cans of beans-the miner in the outhouse doesn’t need any more ‘encouragement’. Many things have been said about the Hall over the years, but this year no one can deny that…it’s a gas! I Wouldn't Go In There If I Were You. Or Even Worse, Under There. Mt. Healthy's 24th Annual Haunted Hall is located at 7700 Seward Ave in Mt. Healthy (between Adams and Compton Rd). It is open Friday through Sunday, September 27-October 26, 8-11 on Friday and Saturday and 7-9 on Sunday. Admission is $10, a donation of a canned good will get a $2 discount. $15 Fast Pass (no discounts) available. You can also print up a $3 off coupon good for the first weekend on the Haunted Hall website. Lights On Matinee for children will be on Sunday, October 20th from 6-6:45. Cost for the Matinee is $5, Free for 'Guardian Adults'. The Hall remains open until the last customer in line has gone through. No refunds on tickets. Sponsored by Madonna Council Knights Of Columbus and assisted by youth organizations. For more information email hauntedhallmattAThotmail.com (replacing AT with @), visit the Hall on Facebook or Twitter, call (513) 729-1974, or visit the Mt. Healthy Haunted Hall website. Because the Hall's A 'Smashing' Success! WORKING THAT HAUNTED HALL MAGIC! In a quavering voice, sideshow magician “The Great AliKillzam” described in graphic terms the results of his unprecedented feats of prestidigitation. Unprecedented in terms of epic failure, that is. The escape artist that he buried alive? Now a heap of bones in a coffin. The woman sawed in half? Well, neither part of her ‘SAW it coming!’ giggles AliKillzam’s flunky. The daring challenge of escaping from a water tank ended with the ‘glass half empty’-the body being freed, but not the head! And the daredevil who tried the ‘Bullet Catch’? Well, that ended in failure, not to mention a big red splotch on the wall. But perhaps the greatest feat of all is that AliKillzam mysteriously managed to come through all of this completely unscathed. TA-DAAAAAAAA!!!!!! This proves once again that magic is best performed on someone else, especially if you’re also a psychotic serial killer. Want to catch his show and perhaps be one of the lucky few chosen from the audience to take part in this amazing display for young and old alike? AliKillzam assures us “I’ll be appearing all week”, working that Haunted Hall Magic! The HOD!!! was ushered into the 23rd year of the Haunted Hall by longtime staffer Betty Hancock, who according to the rest of the crew (and certain other haunt reviewers) inspires more fear than the monsters inside the hall. Despite having doubled the salaries of all the Hall’s employees (“From zero to double zero” adds one of them), she’s currently getting a razzing from the assemblage. “Hey, I’m trying to work here”, says Betty. “And where else are you going to find someone whose hair color matches a red costume?” The easy camaraderie shown by the organizers goes a long way towards explaining how they are able to pull off building the event from the ground up in only three weeks-not to mention tearing it down in a single evening! It also explains why the event has managed to retain its edge for years and remain fresh with several generations working together to put on the best show possible. The Haunted Hall has grown from its humble beginnings where it comprised only the rooms inside the main building. It now stretches across the Hall, at least four tents, a jail complex, a shed, the double sized Black Maze, and a lake. Yes, the Hall now has a real lake in its backyard, constructed out of planking, piping, and a huge liner. With the fog billowing across it in the dark, it looks so real we wish we’d brought a fishing pole. Of course, this is Camp Crystal Lake, so throwing your line in there is apt to have disastrous results. And the bridge across the lake doesn’t look too sturdy, either, especially if, say, some psycho were to come out of one of the tents and begin chasing you with a chainsaw. Not that that would ever happen, y’understand. Or would it? As our description of the magic show indicates, the Hall isn’t afraid to throw in a large dose of grisly humor with its scares. This sense of mirth extends down to even the small details. Perched on a shelf inside the mirrored walls of the funhouse is a small Jack-in-the-box with a sign above it exhorting hauntgoers to ‘turn if u dare’. It’s something most people might not even notice since you’re usually being pursued by a haunt klown at that point. But we saw it and couldn’t resist. We turned it and were greeted by a little creature popping out that featured its own tiny custom makeup job. Not coincidentally, it also acted as the cue for yet another deformed greasepainted freak to come leaping out from behind a mirror. Lots of the Hall’s rooms return from year to year, like the funhouse we mentioned earlier. The same goes for Norman Bates (or is it Mother? ), the Bug Room, the Executioner and his chopped-in-half victim, the Werewolf Woods, the Vortex, the Pumpking in his hall of Jack-O-Lanterns, the Vortex, Satan’s Throne, and the Kreature Kage. Since they’re reconfigured every season and usually placed in a different part of the haunt, they never get stale. And every year, hauntgoers still fall for their tricks. Confronted by a snarling Fangface rattling the bars of his cell, the group we were in couldn’t find the way out. When the loathsome reptile slammed open his cell door, they all began to leap over the rope that delineated the walkway-not realizing the only way out was to go THROUGH the cell door. Talk about confronting your fears head on! The Hall also tends to use lighting that gives these scenes a garishly lit, ‘Tales From The Crypt’ comic book look-something that complements the outrageous room designs well. And speaking of returning rooms, there’s the Hall’s pièce de résistance, the Black Maze. Sure, Black Mazes are used by most attractions to cut down on costs and extend their attraction’s time. But the Hall’s has achieved legendary status. Now twice as large (taking up two tents instead of the original one), the haunt is the ultimate reconfigured room-it’s changed on a weekly basis, or even more often at the whim of the designers. With no monsters inside, you’d think it would just be a fun walk in the dark for hauntgoers, but it inspires more raw fear than anything else in the Hall. It really IS pitch black in there, and it’s horrendously easy to get hopelessly lost, turned around, or cut off from your friends. Stand outside one night and watch as a group enters, only to see the two or three groups that entered after them emerge first-or witness how members of the same group emerge individually over the course of fifteen minutes. What really makes the Hall’s Maze special is that there are so many textures inside-wood panels, half panels, chain link fences, even what felt like a smooth Plexiglas sheet at one point. It’s hard to get a ‘feel’ for direction when the surfaces you’re touching are continuously changing. Dr. Crazy (well, that’s what his name tag says-and since he's Matt's older brother Will, probably accurate) attempts to bring life to the dead, but he’s no better at it than the Great AliKillzam is at magic. He’s the ultimate mad doctor, with a crushed cigarette hanging from his mouth and mismatched eyes. Pulling back the sheet of his latest exercise in reanimation, hauntgoers are treated to the sight of a pile of bloody meat and bones. One might think he’s fumbling his dialogue, but when he’s corrected by the audience it turns out he just wanted to assert his authority, screaming out that “Don’t correct me! I’M the Doctor here!” Since our gal Ayame is a Doctor, we hear that quite a bit, so we dropped into step REALLY fast. At one point early in the tour panic set in for The HOD!!! as it looked like Dracula had finally been retired, ending a long run as the sole surviving representation of the classic Count in the Cincinnati area. In his old digs was a witch who had thrown an unwary child into her cauldron-only the coffin that concealed the way out remained from Drac’s glory days. But after pushing our way through the rear of the casket into the Hall’s last room we saw what appeared to be a familiar funeral parlor. Could it be? Yes! Relief washed over us as Dracula rushed from his hidden vantage point. To show his appreciation for our concern, the Count beat us about the head and shoulders before showing us the door. There’s nothing like staying in touch with old friends. And don’t think for a moment that we’ve forgotten the God of haunt scaractors, the big bony cheese, the insect infested derelict corpse, the creature that is as fresh today as the day he first plopped down in front of his static filled TV…the legendary Bug Boy! The HOD!! !’s favorite haunt character has taken several wrong turns over the years in his efforts to find gainful employment, ranging from trying his hand at rapping while perched atop a police car to swindling seniors out of their welfare checks at the Tired Bones Retirement Castle in his guise as ‘Bug Daddy’. He’s even failed at serving up drinks at Spooker’s Bar (where the Reds always win the series and don’t choke like a bunch of overpaid washed-up loudmouth self-congratulatory losers with the worst manager in baseball who somehow still managed to get his contract extended by idiotic ownership-not that we’re bitter about that or anything). This season he’s trying his hand-not to mention an oversized pair of hedge shears-at the manly art of barbering inside the ‘Handy Shears Barber Shop’ (the ‘infamous outdoor shed’ we mentioned earlier). Unfortunately, judging from the customer seen here sitting in the barber chair (as well as a big pile of severed heads) he’s sure no Floyd the Barber. His special hair tonic is decidedly red and sticky and ‘taking a little off the top’ starts at the neck up (we would insert a bit here about how you really don’t want to tell him you want it ‘long in the back’, but that would be inappropriate and rude). We’re fairly certain this will be another failure for the Bugster, and that he’s going to have to look elsewhere for the money to pay off the exterminator we mentioned earlier. And that’s what we really love about the Hall. While it has some of the most innovative and entertaining rooms in the area, it stays firmly grounded in its traditional roots. It’s old school seen through a modern filter. As the Hall’s T-shirt for the season states (graced with a pile of numbered heads in front of the Handy Shears Barber Shop), “For 23 years a-head above the rest”. And AliKillzam or not, still working that Haunted Hall Magic! But Bugs-That's A Whole Different Story! The HOD!!! WILL Run His Photo. It's That Simple!